I have been writing a story a day now for six days and I am still committed to the process. It is exciting and a bit tiring, but it is a good kick start to my desired trajectory into the land of writing. As I’ve been writing, I’ve been noticing many changes in the way I currently write to how I have written in the past. A lot of these changes have come from my maturing as a person and also (I’m sure) from a more skeptical personality that I have developed over the course of many years. I will endeavor to discuss some of these changes as they become apparent, but what is of particular interest currently is something that Ben and I have had some interesting conversations about; the art of the happy ending. I love a good happy ending, I love a good romance where everything is peaches and cream and sugar and spice in the end. I want to see the heroes save the day, I want to be scooped up in the arms of excitement and pushed forward into the dizzying light of glory and victory. All of those things are marvelous and inspiring and something that in the past I have written with great relish. But I find things have changed. Over the past six days I have found myself drawn more and more into the land of ambiguity, where, more often than not, there is an open-ended ending. In a short story this need feels more pressing than ever for me. I long for the subtle and the vague. Coming from a place where my stories contained blissful enlightenments, glorious fantasies and neatly wrapped endings I find myself feeling the need to draw outside the lines. I have considered the idea that in a novel the investment is greater and so it feels like more of let down if we don’t get our happy ending. This would especially be true from the perspective of the writer who spends more time with the characters than a reader likely will and becomes so deeply invested in their journey. But even then, I am not sure that is entirely true (that a novel needs a happy ending). 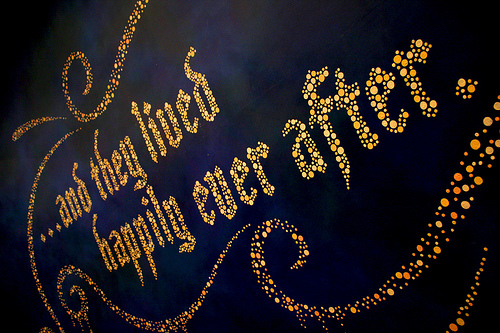 Happy endings surely provide us with feelings of closure, security and well being. Happy endings are wonderful but I find ambiguous endings to be more alluring these days. They provide me with a feeling of mystery, the ability to question and imagine things for myself and the desire to look at the greater picture in a more philosophical way than I might if I were contented and happy. There is a possible explanation for this too. We learned in social psychology class that the happier you are the more mental shortcuts you’ll take, the less you will critically analyze things and the more you will ignore potential issues that arise. So is the happy ending like a drug to us? Providing a quick dose of chemicals that numbs us to looking at the situation more in-depth? I don’t always want my stories to feed me what I want to hear, what I expect and what makes me happy. I want them to challenge me, make me think and make me consider things from other perspectives. By this rationale the same logic could be applied to sad endings too, but I find if they are too depressing it distracts me from the point and leaves me in a funk that drains me of my desire to think about it further. As I continue to move forward with my writing I will embrace the ambiguity I am growing to love and see where it takes me. I would love to hear other readers and writers thoughts on endings. What do you like? What do you hate?